UDM Downloads > Convert Image File to PDF! Convert Image File to PDF Generate from images and TIFF in PDF. Image into PDF maker utility is a fast, quick, affordable and easy-to-use PDF converter application that is specially designed for convert batch picture files into single or individual PDF files. Images to PDF creator can create PDF from all formats such as PNG into PDF, JPG into PDF, JPEG into PDF, GIF into PDF, TIFF to PDF, GIF into PDF, TIF to in PDF. PDF maker has option to change page size, page margin and image size. Generate PDF from images and PNG to PDF. Image into PDF maker utility is a fast, quick, affordable and easy-to-use PDF converter application that is specially designed for convert batch picture files into single or individual PDF files. Images in PDF software insert images JPEG, JPE, JFIF, BMP, PNG, TIF, TIFF, GIF, JPG, ICO formats and click Convert button. Images to PDF converter can create PDF from all formats such as PNG to PDF, JPG to PDF, JPEG to PDF, GIF to PDF, TIFF to PDF, GIF to PDF, TIF to in PDF, etc. JPEG BMP GIF PNG TIFF into PDF converter change image files into one PDF document files. 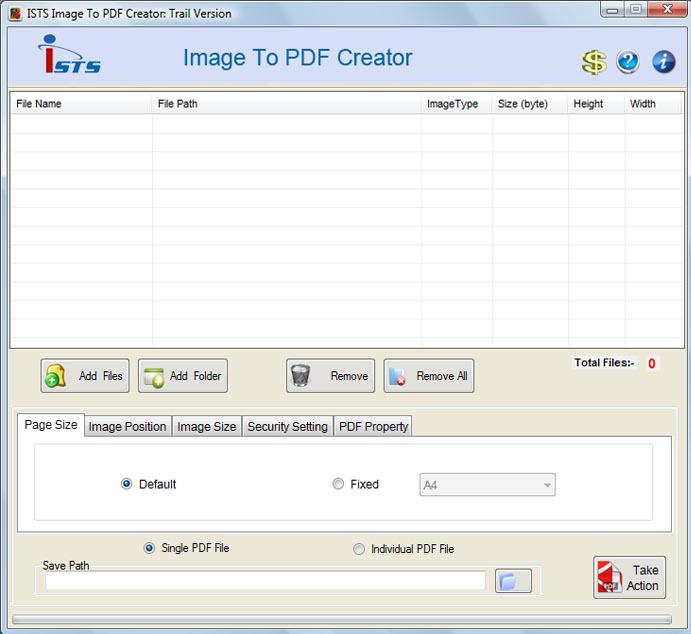 Convert Image File to PDF Features: * Convert insert merge multiple frame TIFF into PDF. * Converting multi-page PNG to PDF * Image to PDF Maker has option to make PDF of all listed images in one PDF file or individual PDF files. * Supports batch image conversion. * Image conversion supports batch image conversion. * JPG into PDF utility has option to change page size, page margin and image size. * create Images from PDF creator join combine merge add turn import multiple images, graphics, scans, faxes into PDF files. * Successfully runs under Windows 7, Vista, XP, 2003, ME, NT, 2000, 98. * Supports to convert all image formats such as PNG to PDF, JPG to PDF, JPEG to PDF, GIF to PDF, TIFF in PDF, GIF in PDF, TIF in PDF, etc. * Supports all type of graphics, faxes, scans, pictures, photos, images, photographs, stills, snaps, shots, screenshots, etc.